I just wrapped up my dream job. 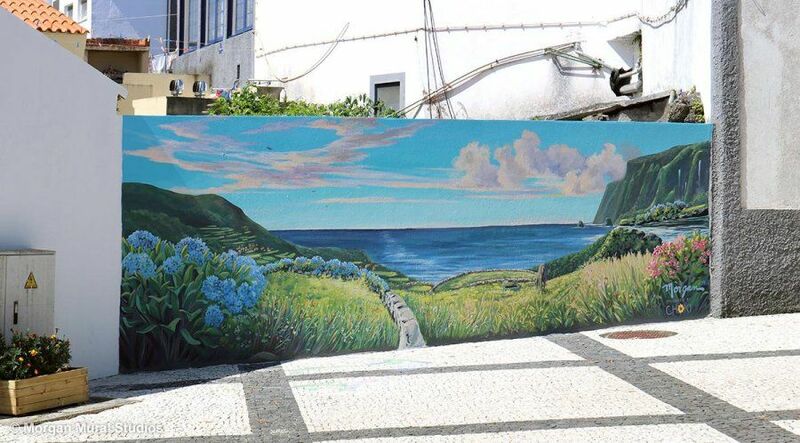 I painted fifteen nature themed murals in about as many days on a lush, tiny Portuguese island in the middle of the Atlantic called Ilha das Flores, The Island of Flowers. I have been carrying a lingering euphoria around with me for months, ever since my clients, Casey and Andrea, sent me the first e-mail with their idea and photos of the Island of Flores. For me, the whole project unfolded with a “meant to be” quality, including alignment of purpose, subject of the artwork, and the perfect challenge for me as an artist. I loved working with Casey Hartnett and Andrea Pinto, the couple with the vision and the gumption to put the mural project together. Casey, an American, has MBA, CFA and CFP credentials and had a lucrative career in finance when he had the epiphany that he wasn’t happy with his narrow, workaholic life. His pursuit of happiness led him in a new direction which included leaving his job, travel (including multiple trips to Bhutan), and maximizing his time in nature, including surfing and scuba diving. Andrea, who is from Venezuela and has equally impressive credentials as Casey, could probably be happy anywhere. She reminds me of a real life Disney princess, and seemed to be followed by a trail of butterflies, puppies and shooting stars. Together they make a powerful team. They set out on a new path that included founding Choki, a non-profit with the mission to protect the culture and traditions of some of the most sacred places left in the world. Their pursuit of happiness also resulted in a move to what Casey describes as “The most beautiful place in the world”, Flores. (It’s prounounced flourish; I love that.) Their home is mostly garden, and includes a twenty foot waterfall, 180 degree ocean views, eight chickens, four dogs and a goat named Karma. Andrea and Casey belong in a special category of “high action” island dwellers.They are both doctoral candidates; Andrea is studying environmental economics and Casey studies sustainable economic models. They also run the most popular café in town. And remember, they’ve got the farm to run. 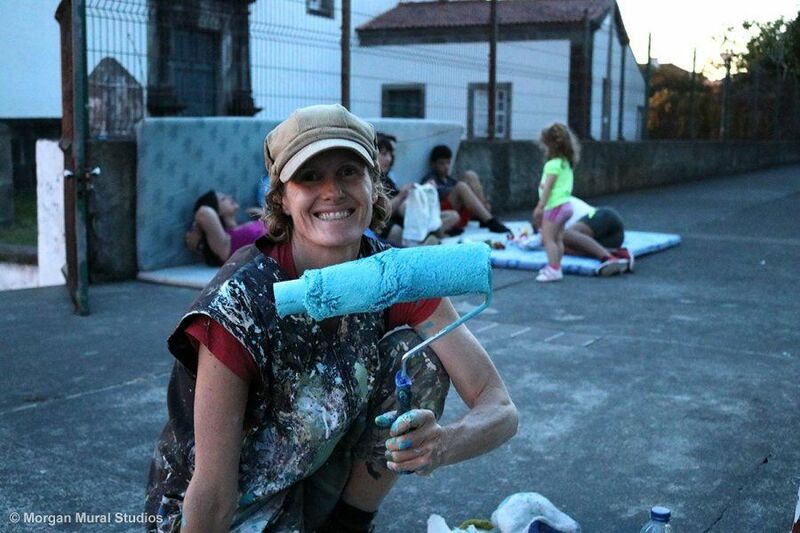 They don’t think happiness comes from sitting in a cave alone but by participating in the community and using their skills to make the world a more beautiful place. They love Flores. They are not native to the island but they want to see it thrive in the long term. Despite the wealth of ocean rights they provide to Portugal, the Azores is one of the poorest regions in Europe. There are rumblings of revitalizing the local economy of Flores through a traditional tourism model. The island is small, 55 square miles and about 2000 inhabitants; half live in the main town of Santa Cruz. A tour bus would overtake both lanes of the narrow roads and a single large hotel would overshadow the whole tiny downtown. 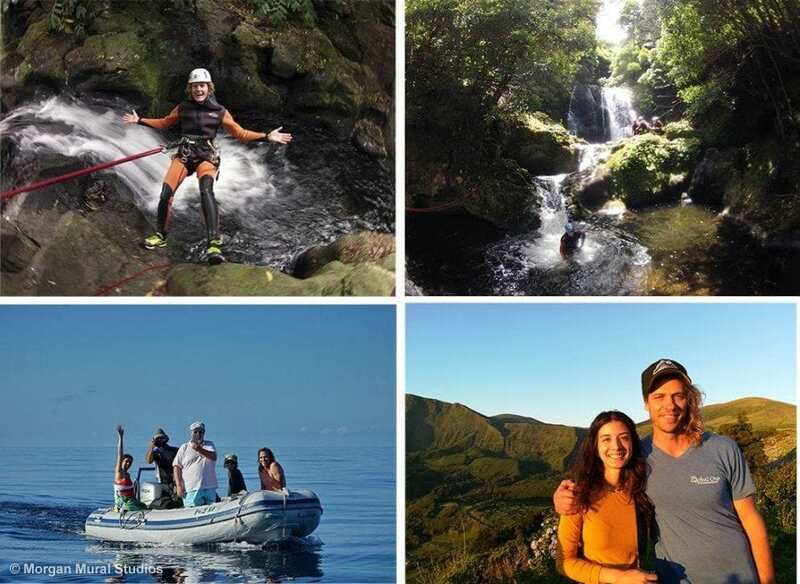 Casey and Andrea would like to see a more holistic approach of development through ecotourism, attracting nature lovers like stargazers, birdwatchers and outdoor adventurers who want to both enjoy and preserve the natural beauty of the island. They are developing a volunteer tourism program, where skilled individuals develop their own passion projects on the island. This is where my project fits in. 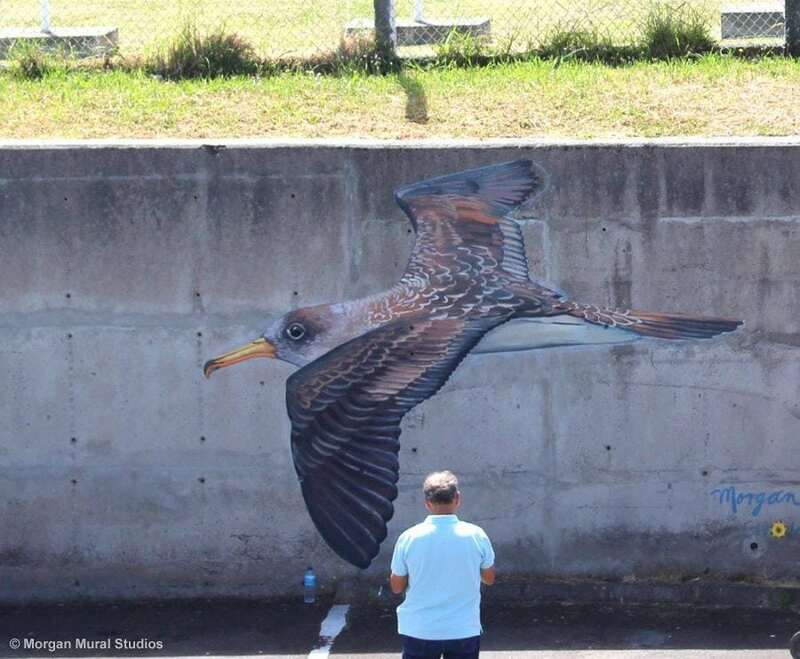 I took on the Flores project pro-bono because the project was perfectly aligned with why I make art, and because it provided the opportunity to make the impact that I believe public art could have on a community. The population of Flores has been in decline for several generations, with the young people finding better education and jobs on the mainland. I spoke to several residents who offered excuses as to why they live on the island, as if they were marooned on Flores and not living there by choice. Remember, according to at least two residents, this is the most beautiful place on the planet. Why would some of the locals feel they are “stuck on the island?” Casey and Andrea noticed this and felt that an art project that celebrated the unique beauty of the island would help locals experience their home as something to be proud of, not as a forgotten outpost. Images of nature pull us out of the everyday busyness of our domestic lives and invite us to slow down. They transcend tribe or personal identity and help us appreciate a broader perspective of life and the place we live. 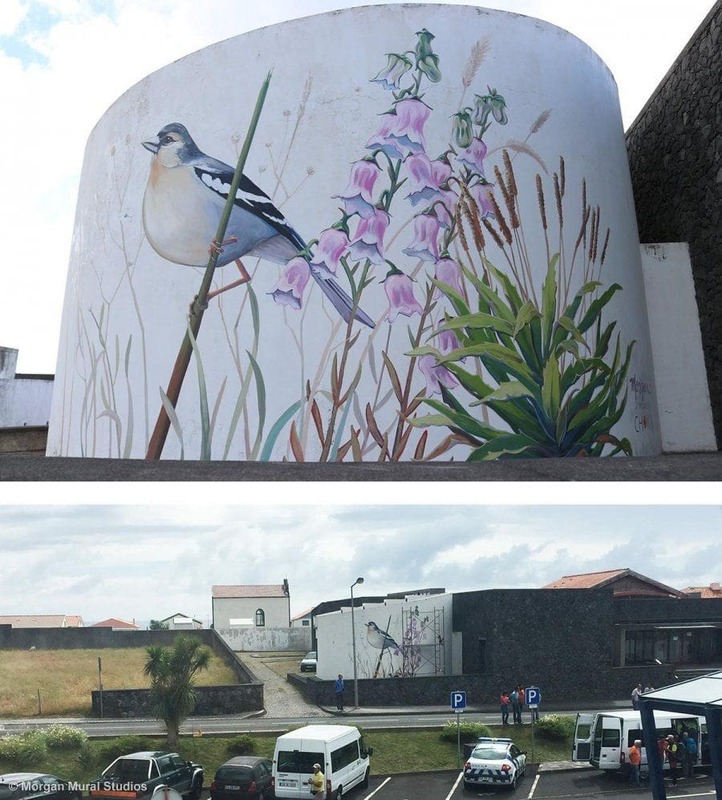 In the case of the Flores murals, the artwork served to educate visitors on what they might see during their stay, as well as celebrating the most beloved bird and flower species for residents. 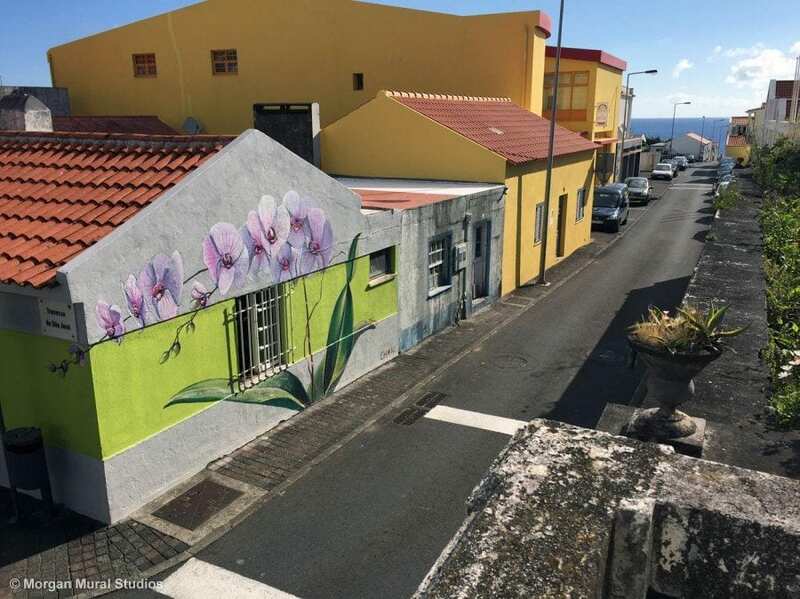 The murals painted in town add a dynamic and feminine element to the simple and sturdy traditional Portuguese architecture. 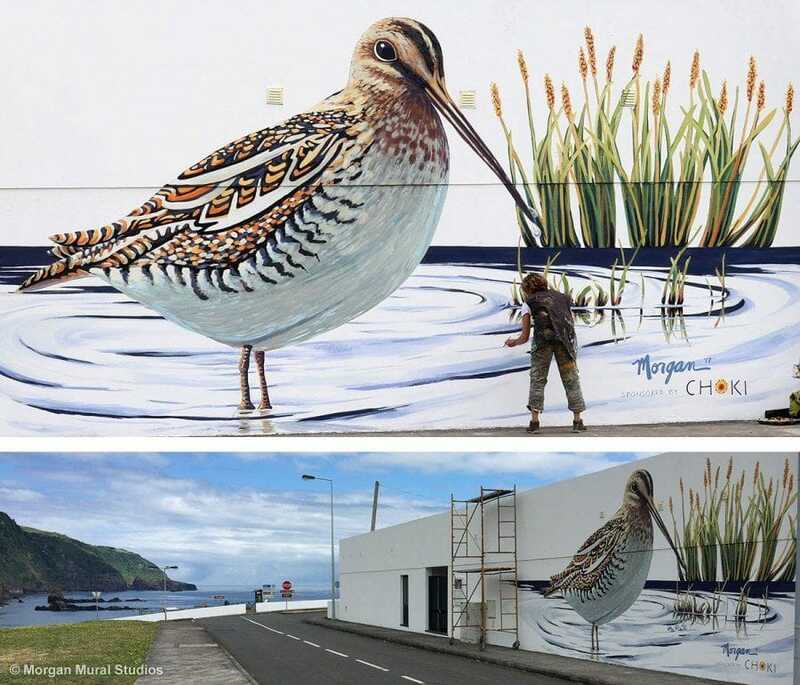 For tourism, the artwork creates a visual story that sets it apart from other places and makes it look cared for. 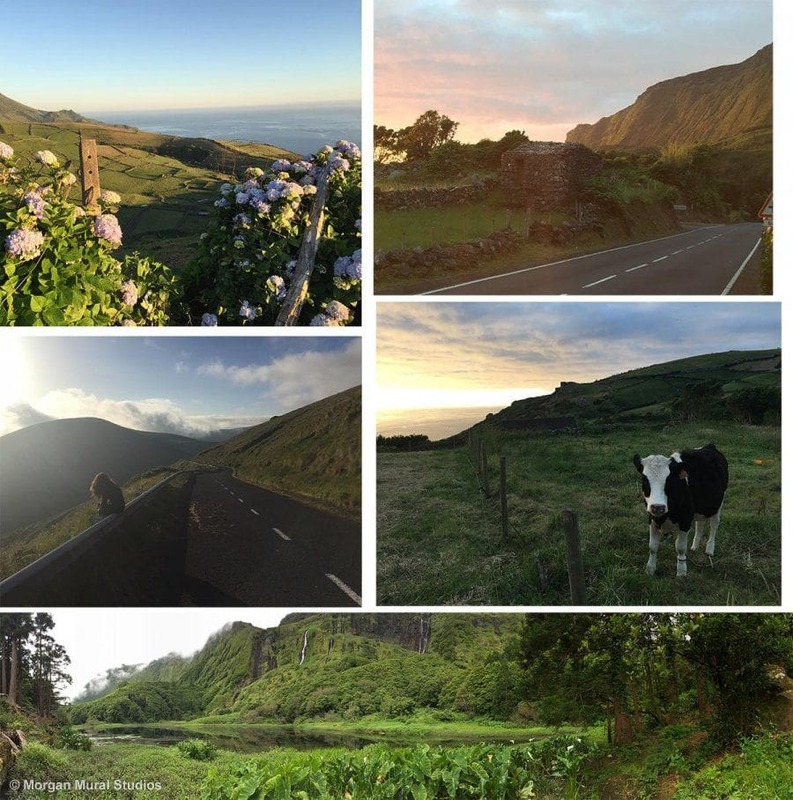 Flores is the westernmost point of Europe, (also the only island in the Azores on the American continental shelf) and has been a key stopping point for seafaring ships including pirates, explorers and traders since the Phoenicians. 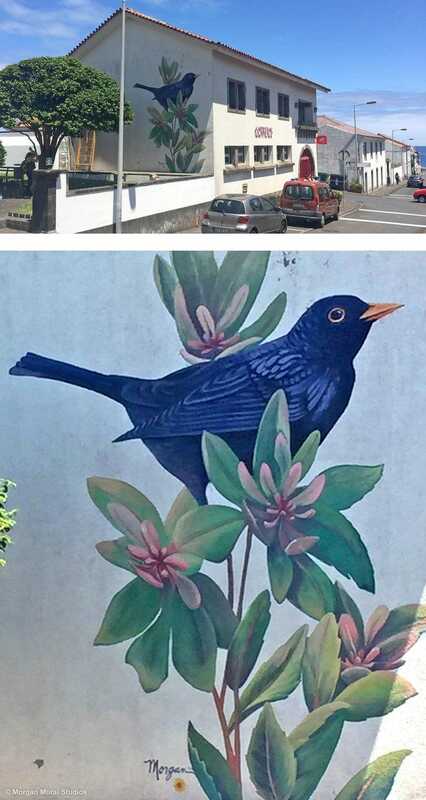 Because of it’s unique history, I included both endemic species as well as species that come from other parts of the world but have become emblematic of Flores, like the hydrangeas that line the hedges. I don’t know if I would work for Casey and Andrea again. They kept interrupting my workflow to take me swimming with the dolphins, snorkeling, and canyoning, among other distractions. In the name of research, of course, I went along. ”Island time” took on new meaning as I would sometimes start my workday at 5 or 6 pm, painting until twilight, which was around 10 pm. I was reminded during my excursions that being in intact ecosystems does create moments of awe, connection, and oneness. There is a word for it: eutierra. In our cozy supply chain of commodity economics, I forget that every breath, every meal, every endeavor is supported by nature, and earths bounty. I felt so alive when I was there. Casey and Andrea tell me that that is a typical response to the island. Hold on. I can’t resist. More vacation photos. 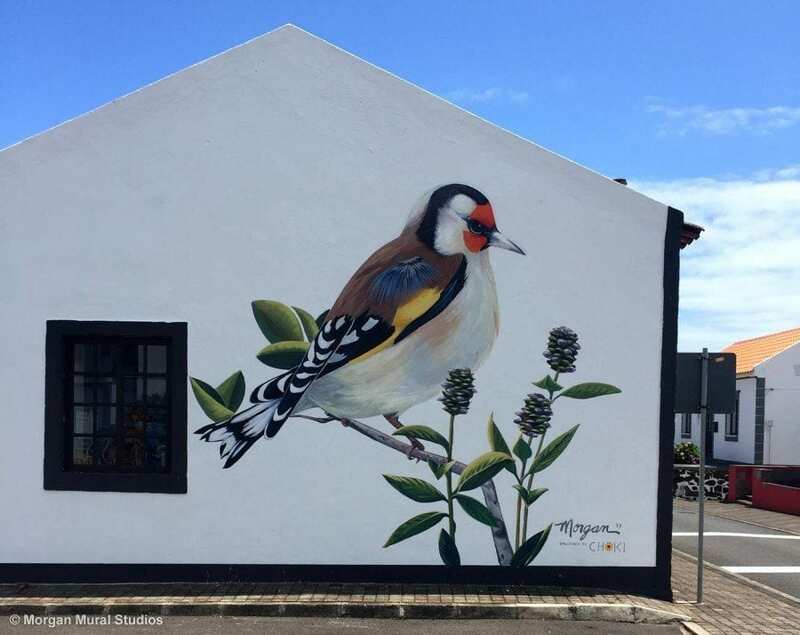 How did two foreigners, after only one year on the island, manage to pull together a massive mural project to revitalize island pride, including getting approval on 15 large walls in prime locations? 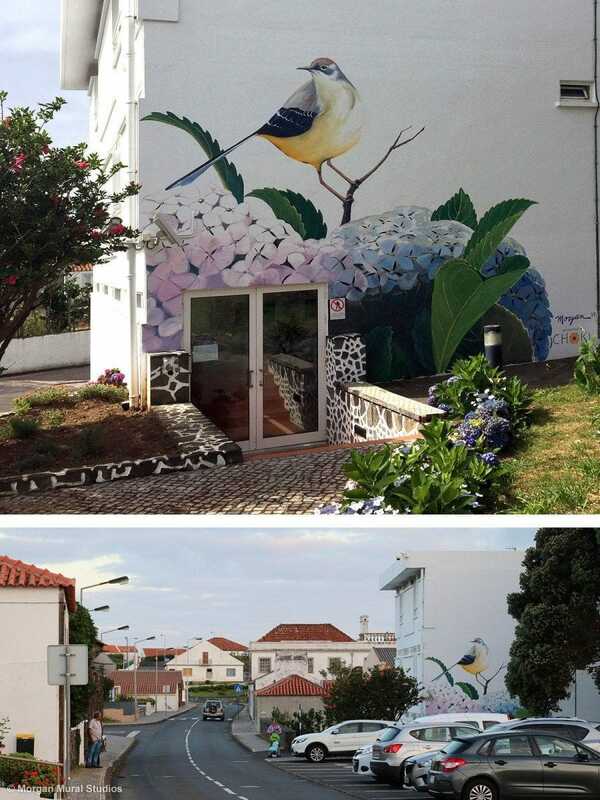 How did they gain approvals all the way from Lisbon to paint on these government buildings? That is an amazing story that I will chronicle in next months newsletter, along with an image of my favorite mural I have ever painted. Thanks for being a part of the adventure!